The Kava Tincture Max contains 1oz of highly concentrated kava extract. Just 40 drops per day is all you need to enjoy the stress free benefits of Kava, without the mess and tedium that comes with preparing kava drinks. If you’re looking for the most intense Kava experience available, then you’ve found the right product. Our new, expertly-formulated Kava Tincture Maximum Strength weighs in at a hefty 12% Kavalactone content. That’s about as much in a 2 dropperfuls of Kava as you would get in an entire shell of Kava. In independent studies, our Kava Tincture Max has been shown to help reduce anxiety and increase well-being, especially when used over a period of several months. We’ve taken it to the extreme for those more experienced with Kava, while still making it compliant with the strict FDA standards in place for all Kava products. With a 12% total Kavalactone concentration, and a surprisingly delicate flavor for the strength, you will find this as your new “go to” Kava, whether on the go, at home, or whenever you need a jolt of Kava goodness to help relax you. This organic full spectrum Kavalactone extract is crafted from the highest quality farmed or sustainably harvested Kava root in pure grain alcohol. Full spectrum extracts. Hand-crafted in small batches. Infused with pure passion. 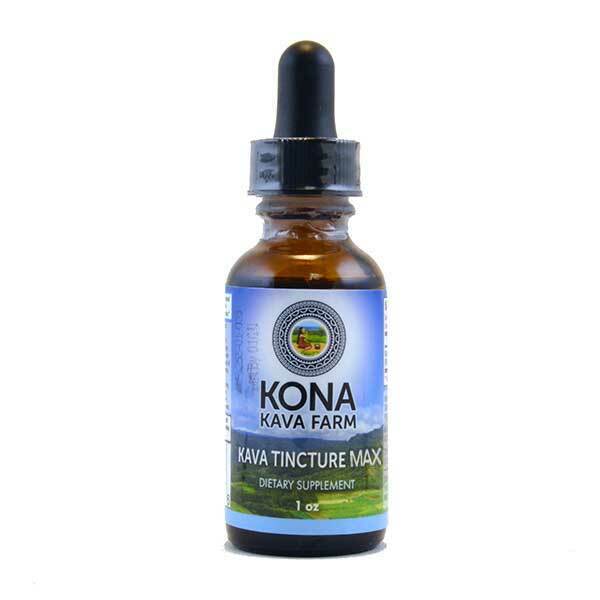 This is our Kava Tincture Maximum Strength, which boasts a 12% Kavalactone concentration; a concentration that’s higher than any other Kava Tincture on the market. One dropperful and you will know, the moment your mouth starts to numb, that this is unlike other Kava tinctures available in the marketplace. Directions: Shake well! Take 40 drops per serving, once per day. Do not exceed recommended daily dosage. Ingredients: Kava root water-based extract, at approximately 12% total concentration. Read more about our Strongest Kava product in the Kava Tincture MAX review page and our “What is the Strongest Kava Product I Can Buy?” article. An incredibly convenient, portable way to relax. The taste gets some getting used to. But worth it. The tingle in the mouth and the euphoric calmness that follows is fantastic! I highly recommend! Ordering my second bottle. Customer for life! Do you have samples of this? or know how many servings it is? We are sorry, but there are no samples for Tinctures. This Tincture has 15 serving. Could you have benefits by taking half the dose twice a day? Say, 20 drops am and 20 drops pm? HAVE A YOUNG GUY SUFFERING FROM MIGRAINES DIRECTLY RELATED TO STRESS. THIS PRODUCT SEEMS TO HELP HIM A LOT. HE IS ABLE TO GET THROUGH THE DAY IF TAKEN 10 OR SO DROPS A COUPLE TIMES A DAY (12 HR PERIOD). Good product, would buy it again! A Relaxing and enjoyable mellow experience with out the drag down effect of alcohol, it helps with my chronic nerve pain in my left leg due to nerve damage too. I can’t vouch for others, but no matter what it’s better then any antoflamatory or the narcotics have been in my nueropathy treatment. They simply DON’T work for nerve damage. Gapapentin(neurontin) isn’t even approved for nueropathy, yet that’s all I can get. Easy to use on the go. Super strong flavor, but easily tolerable. Effects kick in quick, a little pricey. Overall excellent! Helps so much with my anxiety! This is definitely not for the faint at heart, but for specific times (massive anxiety attacks being one). The first time I used it, I almost immediately calmed down (within 10 minutes) and was able to get to sleep. Price is a bit high, at least for me, so I keep this to make the worst times more bearable. Absolutely wonderful!